I cannot share what is happening with God’s Church in Cameroon without referring to the socio-political crisis. The pre-dominating crisis is attributed to the marginalization of the English-speaking regions of Cameroon. News of kidnappings, killings, burning of villages, random arrests are shared via word-of-mouth, social media and privately-owned news houses. “Internally displaced persons” is becoming a very familiar term. Question: How should the Church minister in such a context? Answer: By God’s grace and very carefully. So far, we are safe. We praise God for that. We live with nightly curfews (now reduced to 9:00 pm – 5:00 am), weekly general strikes where almost all businesses are closed (most frequently on Mondays) and when we travel, we find out as best we can of where the current unrest “hot spots” are and avoid going that way. As a young Cameroonian pastor prayed, “We are vulnerable, but you, God, are our protection.” We see the Church in Cameroon being refined in this. Amidst this backdrop, ministry continues. I finished editing the revisions in the Cameroon Baptist Convention (CBC) Financial Regulations. The changes were highlighted in a 3-day seminar where over 60 people serving CBC ministries in 6 of Cameroon’s 10 regions (like provinces or states) converged in Bamenda. Even though I am still adjusting to my new role as Cooperating Missions Accountant in the CBC Finance & Development Department, I am also giving orientation to Mrs. Susanne Hohn to do the job, so she can cover the role when Florence and I depart for home assignment (furlough) in July. Florence continues in her dental practice, choir directing and farming project. Despite the political crisis, opportunities for needed recreation and fun have come. A missionary colleague and I had been desiring to go mountain climbing. Twice our plans were thwarted because the mountains we chose to climb ended up being in close proximity to unrest “hot spots.” We ended up hiking up a mountain that we have never climbed before, that we can see from our Bamenda compound. And it was a privilege to appreciate God’s creation. Florence and I also enjoyed the visit of Rev. Larry Burd from Calvary Baptist Church, Easton, PA. He is an encourager and great story teller. When the missionary children came in March to our Bamenda compound for a 2-week get together home schooling session, I “had” to take 2 hours off each morning from the finance office, so that I could help several of them with their swimming lessons. That was not too hard to takeJ. 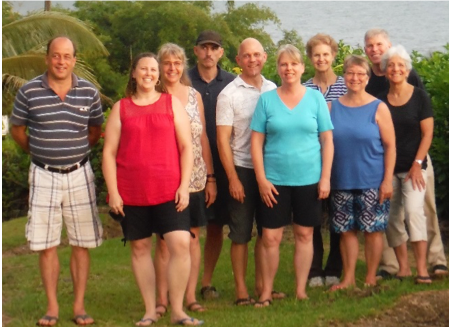 In April the NAB missionaries travelled to the coast for a 3-day retreat on the Atlantic Ocean. That too was a nice break. Indeed, Jesus has come to give life to the full.